You'll be £19.99 closer to your next £10.00 credit when you purchase Cities of Gold. What's this? For half a millennium, legends of vast treasures—El Dorado, Ciudad de los Césares, Sierra del Plata, and the Seven Cities of Cibola—have been part of the lore of the Americas. Long before the Spanish set foot in the New World, however, myths and rumors of fabulous wealth in some distant lands had entered European popular culture. Stories of mysterious realms in Africa and Asia had been alive in castles and seaport taverns for centuries. Accounts of these astonishing places, such as the kingdom of Prester John, were told and retold so often that they were assumed to be true. The New World was a blank slate for the early modern imagination, and into this land, European dreamers could read all sorts of possibilities, such as Juan Ponce de León’s search for the elusive Fountain of Youth. When the first conquistadors made contact with Mayan, Aztec, and Inca civilizations, they found cultures that were literally dripping with gold. This evidence made it easy to believe the native stories of even greater wealth just beyond the horizon. 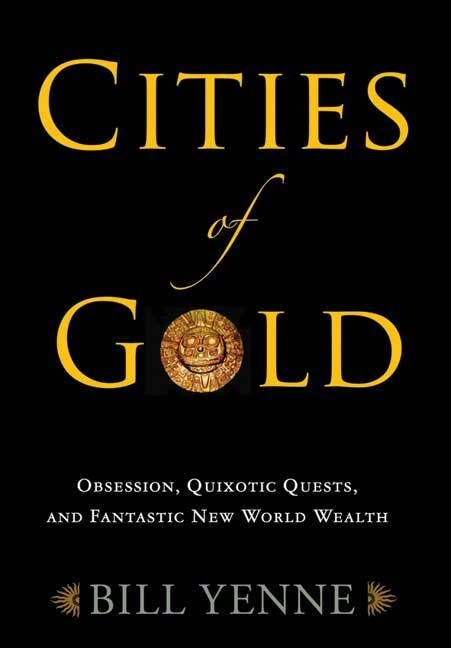 In Cities of Gold: Obsession, Quixotic Quests, and Fantastic New World Wealth, Bill Yenne takes the reader from the jungles and mountains of Peru, Paraguay, and Venezuela to the deserts and peaks of Mexico and the United States to tell the extraordinary story of how the search for legendary New World cities fueled the exploration of an unknown hemisphere for hundreds of years. Even without finding the places they sought, during Spain’s “Siglo de Oro” in the sixteenth century, the Spanish plundered and mined thousands of tons of New World gold and silver and shipped it home where it reached a staggering modern estimate of two trillion dollars in the kingdom’s reserves alone. And it was not just the Spanish who were obsessed with gold: Sir Francis Drake, who once proclaimed himself emperor of North America, also spent time following the legends of gold and silver in the name of the British crown. Discussing the many expeditions to find New World riches and including many lesser-known personalities from Germany, Netherlands, and other countries, the author explains the challenges faced by early explorers, the risks they took, and how the treasures they did and did not find changed the history of Europe and the New World.